Characteristics: light shows white to the southeast, otherwise red. One flash every 5 seconds. 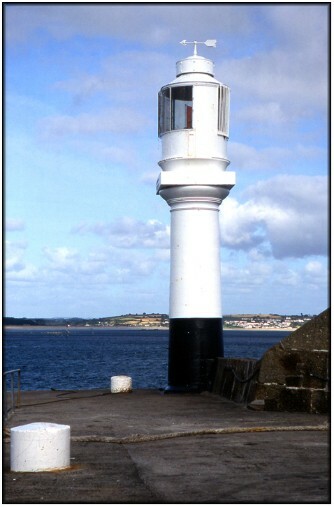 The picturesque lilttle harbour light on the South Pier at Penzance dates from 1853. The cast iron tower was built as a prefabricated structure by the Copperhouse Foundry at Hayle in Cornwall and then assembled on site. Some sources suggest that this light also has (or had) a foghorn, but I can find no hard evidence to confirm this. Indeed, I am not certain that this light still exists in its present form. The South Pier houses the Isles of Scilly ferry terminal and, in 2005, the ferry company submitted a planning application for permission to extend the pier by 65 feet - one element of this plan involved demolishing the current light and erecting a new one at the end of the extended pier, so I am uncertain of the current status of the original light. The pier is open to the public but, from memory, if you intend to photograph the light from the pier itself, an afternoon visit would be likely to produce the best lighting conditions.